The poem "Stille Nacht, Heilige Nacht" was written in 1819 (some sources list 1816, others 1818!) by Father Joseph Mohr of the Church of St Nicholas (Sankt Nikolaus-Kirche) in Oberdorf (Oberndorf), Austria. The church organist, Franz Gruber, wrote the music. Rev. John Freeman wrote the English words in 1863. Although the Haydn Quartet might have recorded the earliest version of the song in English in 1905, it had already been recorded in its original German in 1901 on the Zon-O-Phone label by Betsy Schot, who had been born in the Netherlands in about 1850, but had moved to Berlin to advance her career. Yet another recording preceded even that of Betsy Schot, in fact, though it was made as part of a toy, rather than as a commercial recording in itself. Indeed, this was one of the very earliest disc recordings ever released and dates from about 1890. It was a five-inch/12.5cm. disc, which operated at 100 to 150 rpm and was made of vulcanized rubber. If the record numbers can be taken as a reference, some 860 such recordings were "released" for use on a hand-cranked gramophone toy made by German toy manufacturer, Kämmer & Reinhardt. 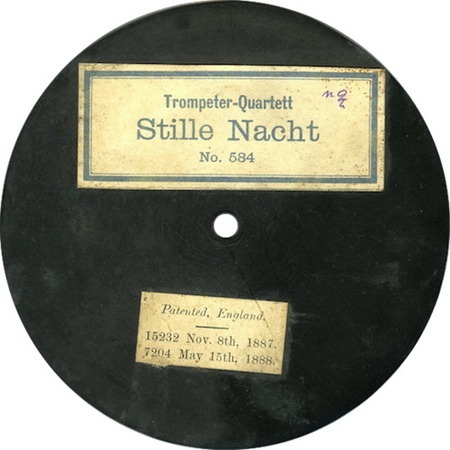 Both numbers 100 and 584 were single-sided releases of the Trompeter-Quartett playing "Stille Nacht" (the information is included on a printed label on the ungrooved side of the disc).